I just so happen to work with a super generous lady and for my birthday, alongside a few other gifts (I’m pretty sure they’ll feature on the blog soon) I got these Rebecca Minkoff beauties that have me back in the earring game. I have two holes in each ear but a for a few years now haven’t bothered to wear earrings unless it’s for a special occasion. I got fed up of the ones I currently owned and just didn’t think they suited me anymore, especially with shorter hair. That all changed the moment I put in these suckers. It was love at first sight. First off, I’m a lover of Rebecca Minkoff and at the start of the year got my hands on a petrol Bowery bag, which I still use every day. Secondly, look at how gorgeous they are. They are silver tone, with what looks like a cute slab of marble in the middle. 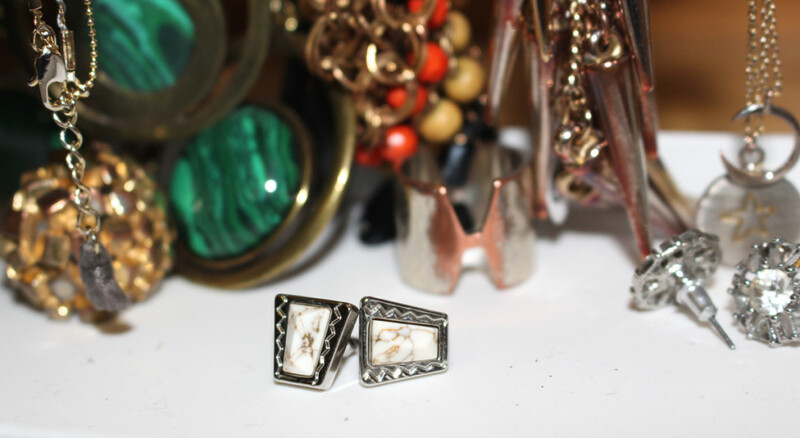 These earrings were made for bloggers, this post is case in point. Next on my list, these Debbie Bolt Stud Earrings from Marc by Marc Jacobs. K.O Rasoi, what have you started?